Obesity experts have developed a vertical workstation which helps employees take exercise and shed weight as they work. The designers, the Mayo Clinic in Minnesota, said it could help obese people to lose up to 30kg a year. Fifteen obese volunteers burned an average of 191 calories an hour using the treadmill, compared to 72 calories just sitting at their desk. The study features in the British Journal of Sports Medicine. The workstation, which is designed to be used for two to three hours a day, comprises a computer, keyboard and treadmill. The steel frame of the device is shaped in the form of the letter "H" and is supported by four locking rubber wheels, so that it can be moved about easily. The frame holds a Plexiglass panel on to which two adjustable arms are bolted - one to hold the computer screen and the other for the keyboard and mouse. Slats provide storage for personal items such as flower vase, cup holder, pen holder or paper tray. The adjustable design enables users to walk and work, stand and work, or, if the treadmill is replaced by a high chair, sit and work. 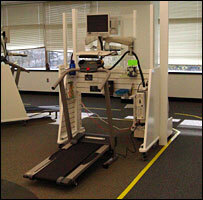 The speed of the treadmill can also be adjusted by the user. The 14 men and one women who took part in the trials all had sedentary office jobs, and none took part in any regular exercise. While using the workstation, they walked at the equivalent of one mile an hour. Their energy expenditure while using the workstation for 35 minutes every hour was compared to that while working at their desk. The researchers said: "If sitting computer time were replaced by walking-and-working, energy expenditure could increase by 100 kcal (calories) per hour. "Thus, if obese individuals were to replace time spent sitting at the computer with walking computer time by two to three hours a day, and if other components of energy balance were constant, a weight loss of 20-30 kilograms per year could occur." Obesity rates are soaring across much of the developed world, and many people blame a hectic lifestyle for failing to make time to exercise. An increase in sedentary leisure activities, such as using a computer, has also been blamed. More than 12m adults and one million children in England alone will be obese by 2010 if no action is taken, a report by the Department of Health predicted last year. John Brewer, director of the Lucozade Sports Science Academy, said: "The growing obesity epidemic is something that requires drastic action. "This is clearly this is something that is slightly gimmicky and unusual, but if it is a way of getting people with sedentary lifestyles off of their backsides then that has got to be a good thing." Mr Brewer said the workstation could potentially appeal to people who found pounding out miles on a treadmill tedious by allowing them to combine it with a more interesting activity. The desks cost £1,000 each.